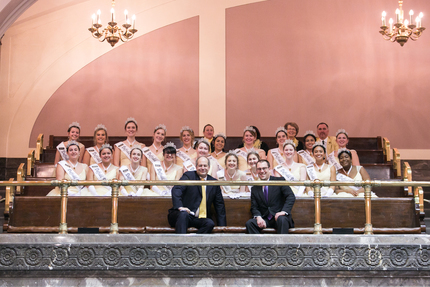 Sen. Steve O’Ban and I met with the 2018 Daffodil Festival Court when they visited the Senate gallery recently. We concluded our work for the 2018 legislative session last Thursday. It was a busy session and we finished on time, without a special session! It was also the most partisan session that I have experienced in my eight years as a legislator. It was the first year since 2012 that both the House of Representatives and the Senate were controlled by one party -- for the past five years, Republicans held a coalition majority in the Senate and Democrats held a majority in the House -- and minority Republicans were not included in many of the key policy and budget decisions this year. I voted against the supplemental budget in large part because it relies on a gimmick: millions of dollars that should have gone into the state’s budget stabilization account (known as the “Rainy Day Fund”) were diverted into a separate account. The Rainy Day Fund was established by a constitutional amendment in 2007, requiring the state to set aside one percent of its revenue each year. Tapping into this account usually requires a 60 percent vote. But by diverting revenues away from the general fund, the majority party was able to go around the constitutional requirement with a simple 50 percent vote, reducing the amount of money going into the Rainy Day Fund by more than $700 million. This at a time when the state’s chief economist has indicated we will collect about $2.3 billion more than we anticipated in 2017. The economy is doing well. With this kind of extra money in our state coffers, The majority party did approve a state property tax reduction, but it doesn’t take effect right away and we could have gone further by eliminating the state property tax increase that is taking effect this year altogether. We certainly have no excuse to go around the state constitution. Fortunately, we reached bipartisan agreements on the supplemental transportation and capital budgets. The final transportation budget included funds to add a third lane to northbound Highway 167 between SR 410 and SR 18, stronger budget language regarding the expectation of a full interchange at Meridian and Highway 167 as part of the future 167 completion project and $500,000 in funds toward improvements in the East Main overpass over Highway 410 in Sumner. Yesterday the governor signed two of my bills, Senate Bill 6162 and Senate Bill 5143, into law. Senate Bill 6162 will define dyslexia as a learning disability and require early dyslexia screenings for elementary-school children. This bill will also reestablish an advisory committee on dyslexia issues to make recommendations on how best to conduct screenings and reading interventions. Senate Bill 5143 expands a property-tax exemption for low-income housing development. This will help those who are struggling to find affordable housing to be able to purchase their own home. I believe that government should incentivize home ownership as a pathway to self-sufficiency. 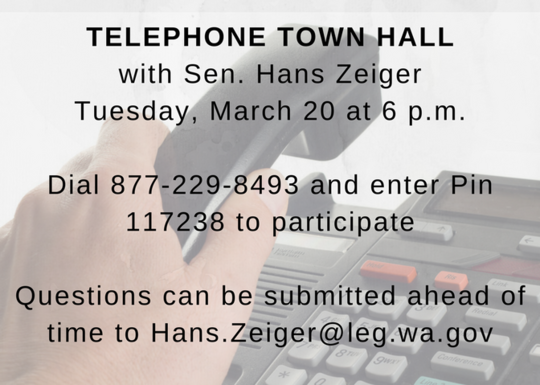 If you want to learn more about the 2018 legislative session, please join me for a telephone town hall meeting this Tuesday, March 20 at 6 p.m. This format provides a great opportunity for people to participate from the comfort of their own home. The event will last one hour and callers can ask questions, participate in instant polls or simply listen in on the community conversation. I want to thank my 2018 legislative session staff. Nick Russell is my legislative assistant and Malika Aiyer was our session aide. Nick has been my assistant for the past two years, and Malika is finishing her studies at The Evergreen State College Tacoma. She started the session as my intern and quickly took on the role of session aide. Nick and Malika have served our community and our state well! 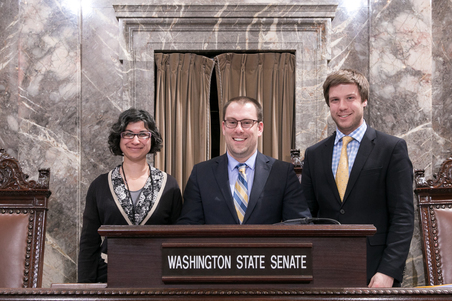 The three of us took time for a photo at the Senate rostrum (above) just before the session ended. I appreciate everyone who took time to contact my office during the session. Even though session is over, I hope you’ll keep in touch.